Amusing. TechCrunch released an article about how Ping isn’t as social as Apple made it out to be. What’s even more funny is that I don’t see this going anywhere just like Genius didn’t go anywhere. First, let me throw it out there. When I find new music, I don’t know the name of the song, or what it is. I just hear something while browsing a website, Youtube, or even listening to the radio. You know what Apple needs to do? Buy Shazam. Take that technology and load it in instead of relying on my friends. Truthfully, what my friends like in music could have absolutely no relevance in what I like. I like opera, but I can guarantee you that my wife doesn’t really care for it. But would we be in the same circle of friends? Sure. That’s a failure in itself for recommendations. Second, I decided to give Ping a shot, even though during the Apple announcement, I was already arguing with people about how Apple could make things nice, but they don’t exactly understand the Internet trends. Let me put it into perspective. Myspace is probably one of the ugliest social networks ever. I said it back when it started, and it still is to date. But yet, the young kids that made it popular is what attracted bands and other musicians to it. That’s also why MySpace still lives… due to those relationships. If Apple wants to attack that head-on, they need to allow every single band lay claim to their pages and have followers able to already follow the band without the claim. For example, I was testing out Ping, thinking, hey… this might not be half bad. Let me add one of my all-time favorite bands: My Chemical Romance. Now I’ve purchased their albums from iTunes before, so I know they exist on there (unlike some of the jrock/jpop/crock/cpop artists), but lo-and-behold, I can’t follow them. No MCR follow means that Ping fails in my book. I mean, the recommendations based on my genres that I selected gave me Lady Gaga, Katy Perry, and Coldplay. All artists that are tied to Apple. What about Daft Punk? What about Gorillaz? If you’re building social, you have to think social. 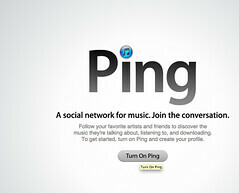 Personally, I think that Ping is a great idea, but the execution was absolutely sloppy on Apple’s part. If you’re going to build a social network for musicians, figure out what the strengths of social networks are and build around that. Don’t tie it directly to your iTunes store. The difference between customers and users might be a credit card number, but the difference between a social network and a store is a world apart.